I woke at 11:15 and asked the desk if there was a Catholic Mass on the islands and the answer was simply no. This is going to be only the second time I’ll miss Mass on these trips. The evening before I had asked the manager, Linda, about “my mountain,” but she was as confounded as all the others I’d asked before. She did have some ideas but said she would need a photo. So I called my son Jeff and asked him to go to my computer and email me the scanned picture I had made before I left. Even though we had checked out of the hotel at 2:00, Linda let me do AOL email free and I sent out Diario #10, but the photo Jeff sent had not yet arrived. 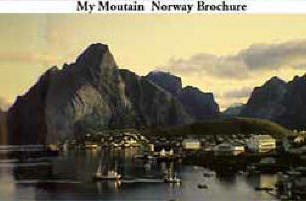 Linda then suggested that my mountain may be the one in Reine, but she said that I had already passed it on the way here. I was hoping she was wrong. At 4:00, we said goodbye to our new friends and took a longer walk into the village. We stopped and had a cappuccino at the Bakeriteatret while I worked on Diario #11. 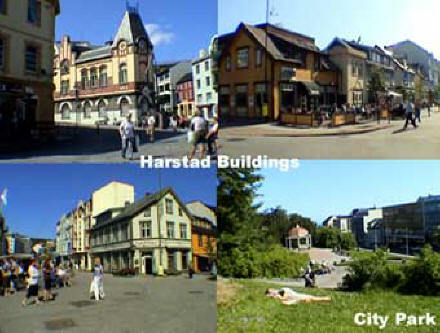 We enjoyed this town and modern hotel very much and would recommend it highly. We had already packed and checked out, so at 5:30 Marcia drove the 35 miles to Fiskebøl, arriving at 6:15 to wait for the ferry. On this leg, we passed by Stamsund (the Capitol of Lofoten Islands) and crossed another two major bridges to get onto the next island called Austvågøya and drove north. Since we had an hour to wait here for the ferry, I decided to do my run here since I was already in my running gear. Running the hills out of the port was tortuous but I made it. Unfortunately not in time to complete my run before we had to get on the ferry. So I ran onto the ferry and finished by running around the boat while Marcia drove the car onboard. I then found a bathroom to change and enjoyed the scenery as we crossed the fiord. 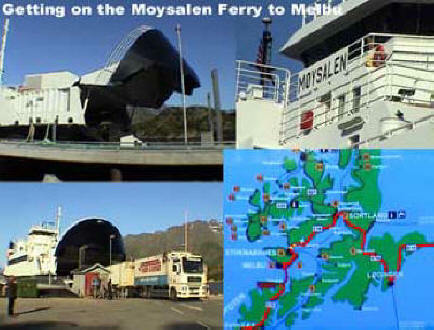 The trip across the Hadselfjorden took 30 minutes and we landed at Melbu at 7:45. 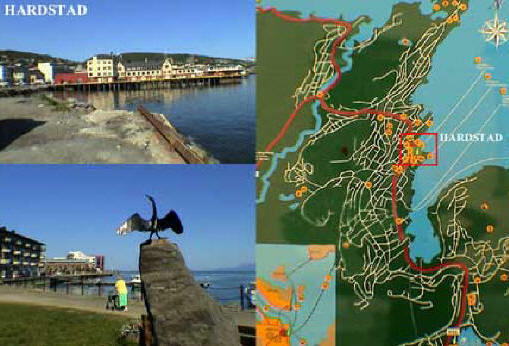 Marcia then drove across the smaller island and then another bridge (below) to the large northern island of Langøya. We continued on across another bridge to the largest and most eastward island of Hinnøya. Through the whole trip I was looking for my mountain but never found it. At 8:30 PM, Marcia had driven about 58 miles along this two-lane highway, when a young boy riding his bike on the right of us decided to turn left across traffic, not seeing us coming. Marcia screeched on the brakes and he quickly turned right and his bike barely hit the back of our car causing him to fall off the bike. We immediately drove back to see if he was OK and another couple joined us that stopped from the other direction. I attended to the boy and he only had a few bruises but was really shaken up. He spoke English poorly, but he told me his name was David. He told us he lived with his grandmother just down the road. 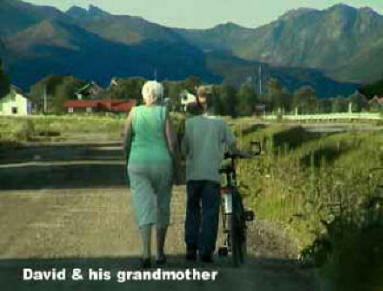 Marcia felt we should take him there so we drove and followed him to her house on the parallel side road. We tried to explain to her what happened even though she spoke no English at all. He then told her it was his fault and that she had warned him about even being on that highway. She took him home and didn’t seem to be to happy with him. I then took over the driving because Marcia was really shook up. 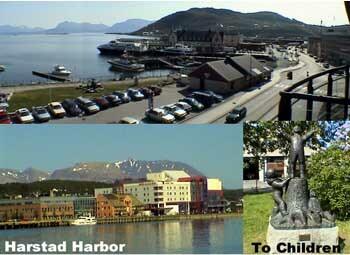 I drove the remaining 82 miles north to our destination of Harstad. 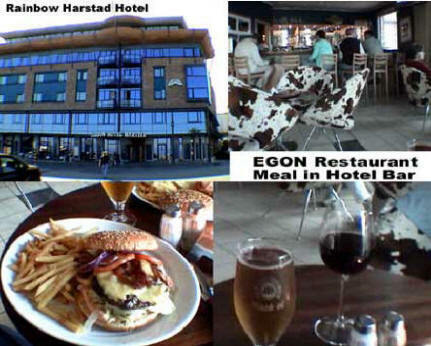 At 10:45 PM, we checked into the GTR Hotel Harstad [Sjøgata 11, +47-7-700-0800] only to discover there were no restaurants open this late and the next door EGON Restaurant [, +47-] was already closed. We went in anyway and begged the guy to make us two bacon cheeseburgers with fries and he relented and agreed but only if we would eat them elsewhere. We agreed and when we went to our hotel, we were told we couldn’t eat them in the hotel lobby. So, we ordered a Mackøl beer and a red wine and sat at one of the lobby tables and sneakily ate our food. This day was turning sour but we got through it. After having another round, we went upstairs. 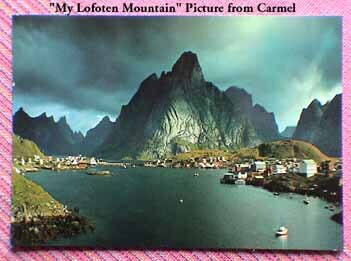 I later came downstairs and the guy at the desk was nice and let me use the hotel computer to get on AOL and lo and behold, Jeff came through with the Lofoten mountain photo. 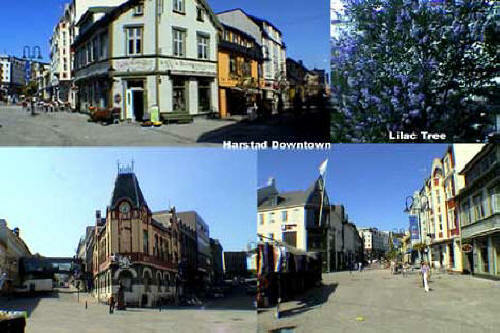 I then emailed it to Linda back in Henningsvær as she had requested. I emptied my memory stick photos from the video camcorder, did a Palm Hotsynch and got to bed at 2:45. 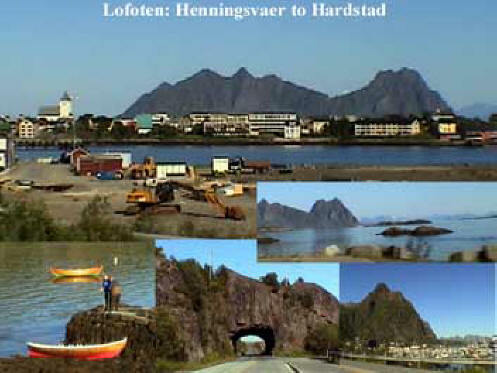 I stopped for a cappuccino at Metzo Café Bar and called Linda back at Henningsvær to see if she had received the photo of the Lofoten mountain I had sent last night. She had and positively confirmed that it was in Riena, which we had passed two days ago. I was dispirited that I had missed it. I then stopped in the Tourist Office and got some information on hotels in the Nordkapp area. On my way back to the hotel, there was a sale on in a men’s shop. The cream-colored Gant jacket they had hanging outside fit me perfectly and it was a bargain, so I bought it. I also happened upon a beautiful Lilac tree in full bloom. I missed them from growing up in Troy, NY. 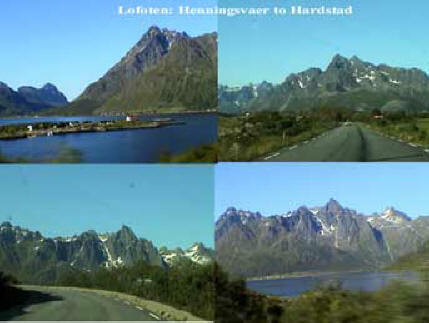 I stopped at SpareBank 1 to exchange some cash and when I got back to the hotel I pulled out the video tape of the earlier Lofoten trip and lo and behold, there it was, as obvious as could be. 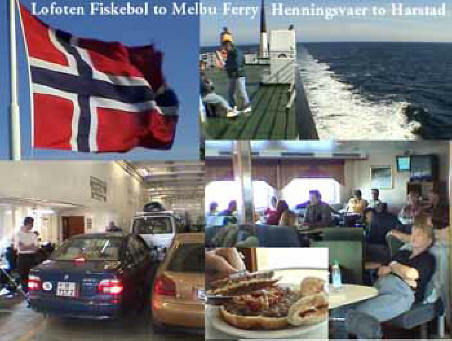 The Lofoten mountain I was looking for from the Carmel art photo (left) and a Norway tourist brochure (right) was beautifully taped as we passed Riena (below.) I had been looking through the viewfinder and must have seen it – but I didn’t really SEE it. Above is a shot from the video I had taken of the Lofoten mountain I had been looking for. At least I didn’t know I had seen it until just now. I’m not sure what the lesson is here. Would I have really recognized it if I hadn’t been videotaping? I don’t know. I may have missed it altogether.